Many times as leaders we get really excited about the visions god has given us. We are very strong willed once we think we have a hold on what God has called us to do. But do you ever think that the vision God gives you will take a lifetime and will go past your existence on this earth? If God told us that it would take a lifetime, would we be so eager at first to accomplish that dream? I have to honestly say that I wouldn’t have been. During time in ministry, working with people, and many nights of being frustrated, a lifetime of fulfilling God’s destiny for my life became overwhelming and almost worth giving up. When you sit down and think about all the work you have to put into it and knowing that you are incompetent or unable, it is really mentally, physically, and spiritually draining. When we review great leaders of the bible, we can never look over Joseph life. Joseph story is one story that encourages me and somehow lives and proves; “It’s not the dream of a lifetime; it’s the dream that takes a lifetime”. Reading Joseph story is almost scary. Look how he was treated by his family. Look what hole he was placed in. Look at how his life went from Up to down. He was moving his way up and all of sudden he was thrown in a prison. However, even in prison, God didn’t take away his anointing. His gift was still present in his bones. He still interrupted dreams. He still heard the voice of God. He still was able to hear God in a hole. He still saw the visions of him ruling over a nation. How can you see such things in a terrible state in your life? I am a firm believer that is just the way God does things. He allows us to squeeze out the best during our most horrible circumstances. The question to us is, Will we dig deep within our soul to squeeze out the best during our worst? Most leaders fall by the waist side when they stop seeing the vision, when they stop seeing the big picture, and when they give up hope. Thank God Joseph didn’t give up hope. In many ways, Joseph was like other great leaders. First, all leaders have a dream, a vision of a better future. In Joseph’s case, he experienced literal visions. Second, the vision and the person who has the vision are inseparable. The leader’s heart beats for the vision, eat for the vision, walk for the vision, talk for the vision, and he won’t be content until it is fulfilled. Another person cannot fulfill that leaders’ dream. We can expect others to help us get to the vision, but no one can fulfill it for us. I can help Yolanda in every way possible, but I can’t sing for her. (Lord knows I’m not gifted in that area) I can help Ylandus all day long, however, Peach is inside of her belly and she can be the only Visionary walking in Peach Ministries shoes. God send us help, however, he doesn’t replace our shoes onto someone else. Third, no leader’s vision can be kept secret. When vision is shared in the right way (note: the right way. There’s a wrong way too ladies), it can enhance a person’s leadership. But when it’s done in the wrong way, it creates problems. And that, of course, is what God Joseph in trouble. After reading this story, I can see how maybe Joseph could have gotten arrogant with his brothers. How many of us just jump into leadership positions without growing. No, let me say this, how many of mature leaders place people in leadership positions when their not ready? I can honestly say that I’ve done this before. 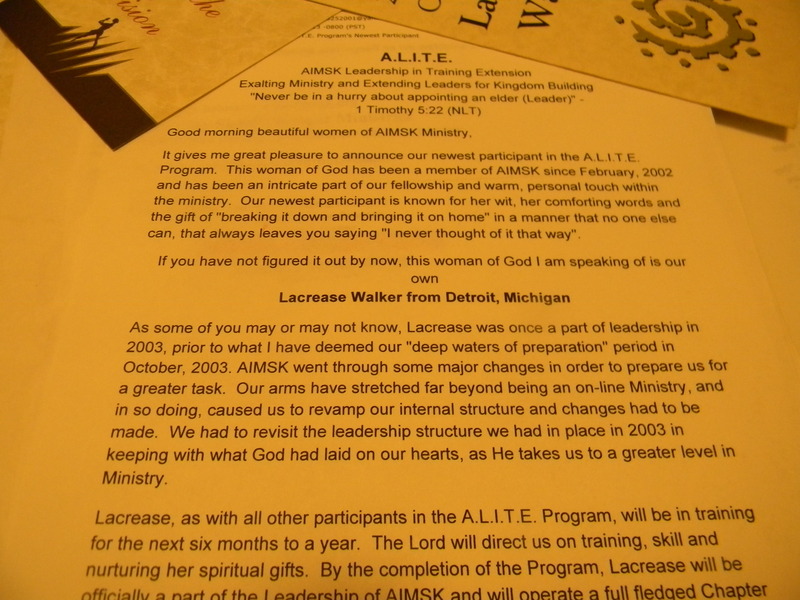 This is the reason for the A.L.I.T.E program and its scriptural base of I Timothy 5:22- Never be in a hurry with appointing a leader. Leaders need time to grow. Joseph labored in obscurity (shrouded in or hidden by darkness c : not clearly seen or easily distinguished )for a season of his life before becoming qualified to lead. How many of us are broken before we begin leading? Joseph was sold into slavery at only seventeen (by research this is the age given), he finally stood before Pharaoh for the first time at the age of 30. Look at this time span, 13 years! He required thirteen years to be prepared. By the time he interpreted the monarch’s dream, he was a changed man. He was equipped. He was humble. He was a great leader. Gold is purified only after it passes repeatedly through the fire. We all should know this by heart with all the lessons Vanessa has given us on going through the fire. Diamonds are created only under extreme pressure. And great leaders are formed only through trials. Joseph would never have reached his potential if he had stayed at home. To become a great leader, he had to become a slave and prisoner. It’s amazing of what God will send us through to purify us. Typing this statement honestly just scared the mess out of me. I realize that I have some more fires to go through, trials to endure, and extreme pressure to go under. I’ve had it good and Lord Jesus I still have awhile to go. Lord have mercy! Without God, a leader can do nothing of real value. Jesus declared, “He who abides in Me, and I in him, bears much fruit; for without me you can do nothing” (John 15:5). God blessed Joseph as he worked in Potiphar’s house as a slave. Then he blessed him as he worked in the prison. Four times in chapter 39 ( I placed the scriptures above so you can go read this story and the word for yourselves) of Genesis the bible expresses God’s favor. For example, Genesis 39:23 states, “The Lord was with him; and whatever he did, the Lord made it prosper.” If you’re on God side, you can’t lose. Every leader needs Gods favor. Whether you’re in a hole, in hell, or in prison, God will show up there and make you strong. It takes a lifetime to fulfill a dream. So the next time you feel as if you’re stagnate or in a place where you feel you shouldn’t be ( I often have these feelings and have to pray them off of me), ask God to give you patience with your own destiny and vision. I know it is times where we want all that God has promised us, but know that we must go through a few things before getting to the vision. We want to act as Joseph did. He was a humble servant and Great leader. Allow God to prepare you as a servant first! Know that we are all here for each other and there will be times where you might feel like you don’t have the energy to go on. Its not the dream of the lifetime; it’s the dream that takes a lifetime.